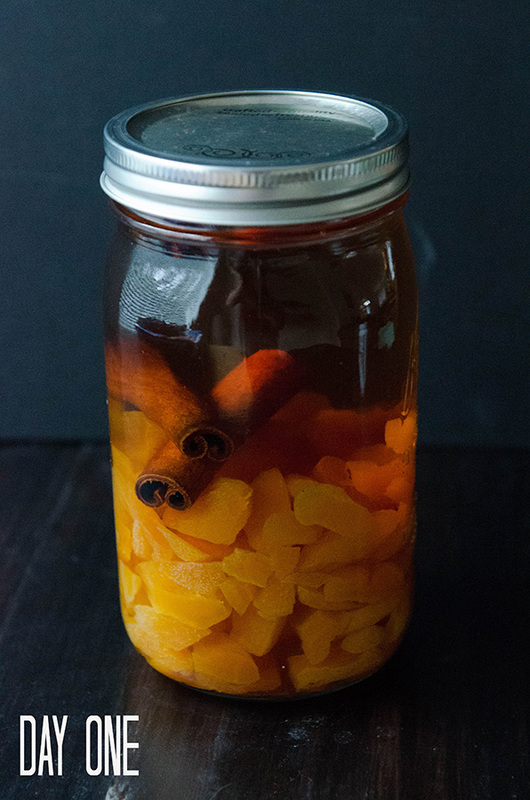 Few things say “Holllliiidaaaayyyy… Cellllleeeebrrraaaaate” to me more than shoving a bunch of fruit and spices into booze to make even FANCIER booze. We’ve done it before with this Apple & Cinnamon Bourbon, with which we’ve expertly crafted these Hot Toddies. But, now we’re delving into the world of dried apricots and ginger and other spicy spices. It’s a good place to be. 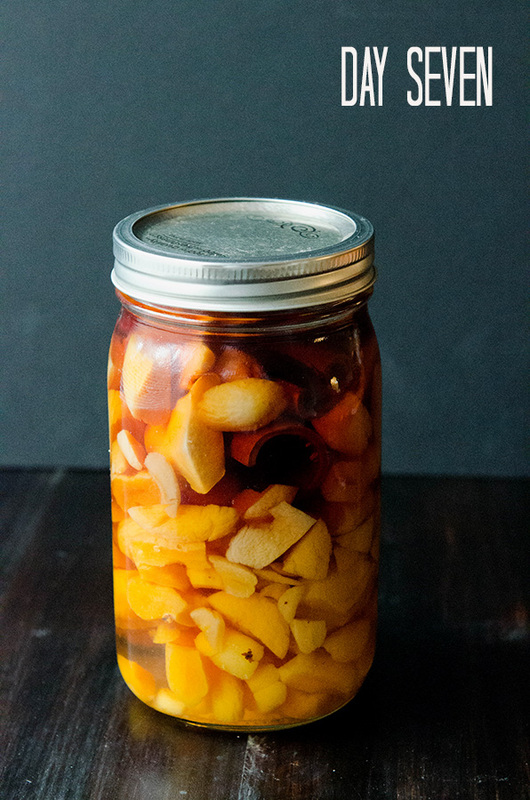 It’s going to make one FANCY jar of booze-juice. Like, people should be excited if you’re their secret Santa. I mean… what would you rather have? 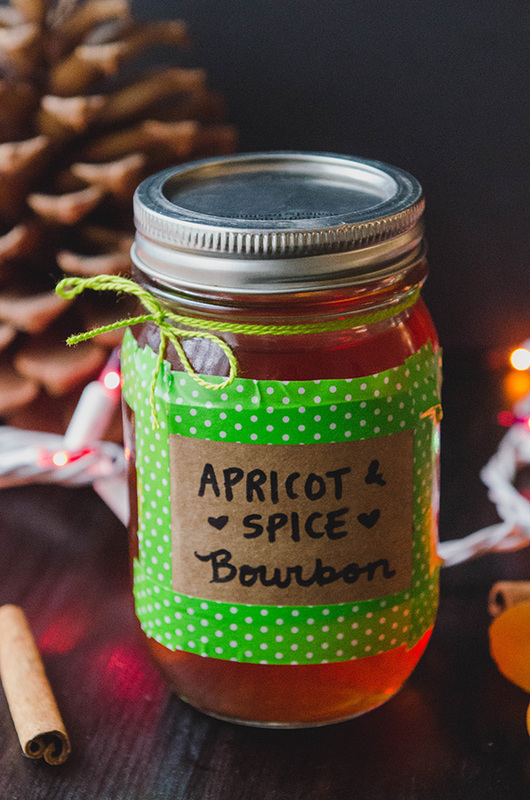 A ten dollar gift certificate to Starbucks or a nice little bottle of home-infused boozy cheer?! If you said Starbucks, I don’t hate you… but, I’m not, like, totally into you right now. We can make up later. Here, have some of my legendary peace-making Vegan Chocolate Pudding. Better? Good. Now, let’s get infusing. In this infusion we’re breaking out the dried fruit. It’s going to speed up the process a bit (I mean, Christmas is less than two weeks away! Yikes!). The only trade off when using dried fruit is that the fruit tends to absorb quite a bit of the liquid in order to re-hydrate itself. I left mine infusing for a week, and it is SWEET. It’s almost like a liquier. You don’t need to let yours infuse as long. I’d say four days would be an excellent stopping point. Or, if you want something that packs a lot of flavor, wait the entire week. It’s really up to you. The longer you wait, the more concentrated the infusion will be. As you can see, on day seven those apricots have become bloated and chubby. The cinnamon stick has expanded. Things are real infuse-y in there. The ginger still looks like ginger. The star anise still looks like star anise. They didn’t get the “make yourself look like the Stay Puft Marshmallow Man” memo. Lucky for us, the flavors DID get the memo. They’re in there. All of them. Oh, hello bloated little apricots. How do you do? Mind if we strain you out and give you a good squeeze? Cool. Run your infusion through a fine mesh sieve. Using a wooden spoon press down on all of the apricots in order to try and drain out as much of the liquid as possible. The color of your liquid is going to be much more amber than you started with. 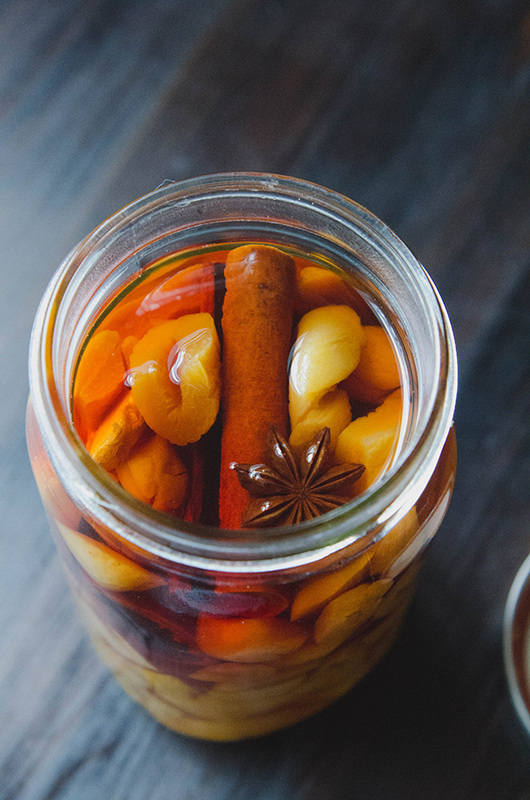 Add your apricots, ginger and spices to an infusing vessel with a tight fitting lid. I like to use a quart sized mason jar. Pour your bourbon into the jar until it is full and close the jar with the tight fitting lid. Allow it to sit on the counter, or in a cool dark place for 3-7 days. Begin testing your infusion after three days to see if it is infused to your liking. The longer you infuse it, the more intense the flavor will be. Once it has reached your desired level of doneness, strain the apricots and spices from the liquid using a fine mesh sieve over a bowl. 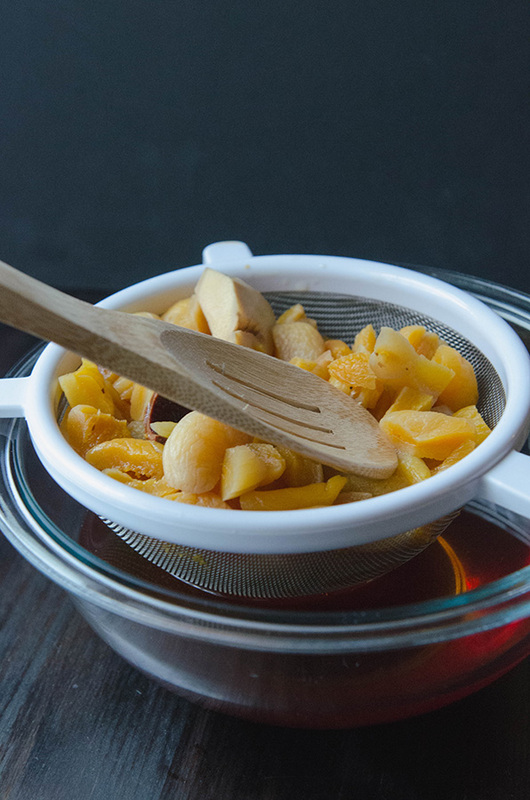 Since the apricots will have soaked up a good deal of the booze, use a wooden spoon to press down on them and release as much of the liquid as possible. 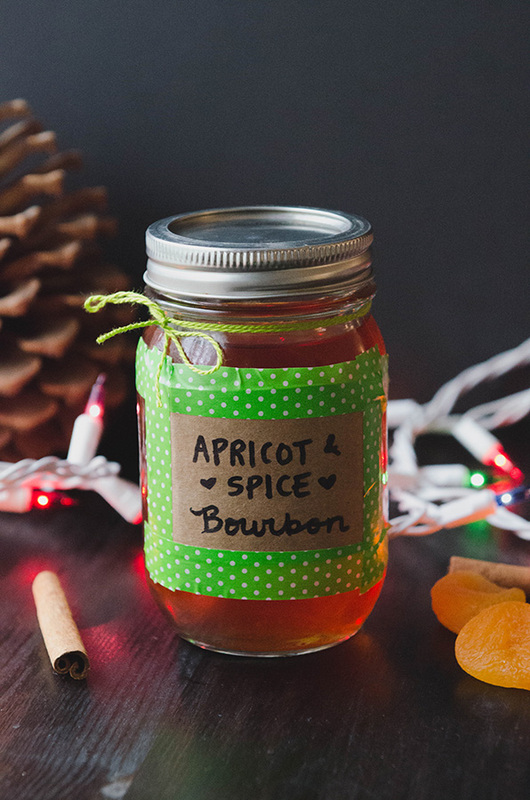 Bottle up your infused bourbon. Add a label and a bow if so desired. Drink it. Gift it. Be merry. That dried fruit kinda makes me think of those little sponge animals that would start like the size of a tiny army man but then you soak them. And soak them. And soak them. And they become big enough to attack your face. But boozier. And right now, I am all about wanting (though, dammit, NOT drinking) all the booze. Celebraaaaaaaaaaaaayte! Looks absolutely heavenly! Plus with all that fruit it’s really healthy….right? Whoa! I’m digging the flavor combination here. I can imagine all sorts of fantastic cocktails this would be good in, although I think I would start with an Old Fashioned. Yum! I didn’t care for them. The alcohol had leached all the sugar out of them, so they were kinda icky. Let me know if you come up for a creative way to use them.